I found myself in Wilmington, DE recently and was excited to see it tagged as the “murder capital” of the U.S. …good times. I’m sure there are some nice areas of town and the surrounding suburbs, but the downtown area was not one of them; the good times had clearly passed by several decades ago. That being said, I wasn’t expecting too much from the choice in dining options and surrendered to the fact that this was going to be an eat to live kind of trip. After much research I settled on a newish bakery/bistro called La Fia, which to my surprise had a James Beard nominated chef. After a perilous 6 block walk from my hotel (there were literally cops on every other corner and sketchy looking dudes a plenty…I was also approached twice for money and/or drugs) I arrived at the quaint La Fia; for the record I decided to take Uber back. With expectations at an all time low, I was surprised and astonished to have one of the best meals in recent memory, Batard aside. The entrance to La Fia is through the bakery, which is accessed through a narrow alley to the left of the store front; once the door opens the unmistakable warm and comforting smell of fresh baked bread hits you. The menu is pretty compact and consists of what I would describe as creative mutli national fare…meaning there really wasn’t a theme, but everything was really, really tasty. Think steak tartar, crudo, shrimp and chorizo risotto and black trumpet dusted Berkshire pork tenderloin. 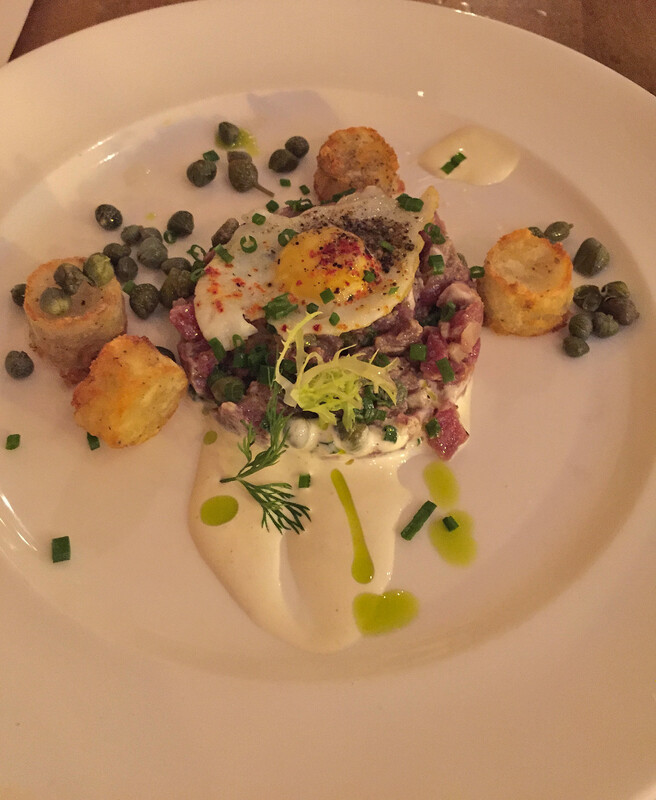 Hanger steak tartar w/ quail egg and potatoes – adult tator tots! All the dishes were very affordable and the service was very attentive and knowledgeable; I would have paid $10 alone for the free bread and homemade butter they served. 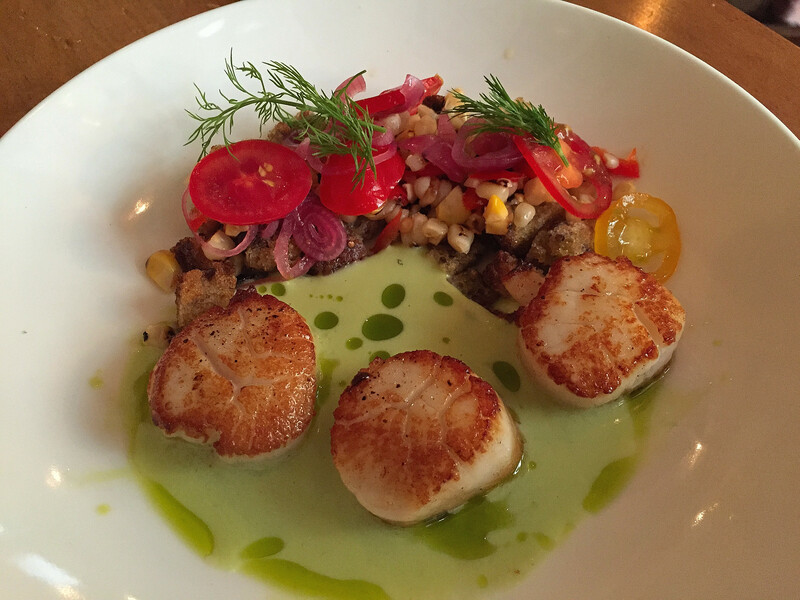 I stuck mainly to the small plates since I was dining alone, but the smoked scallops w/ panzanella salad was truly amazing; definitely in my top five for 2015. La Fia is not destination dining by any means, but it is unique to the area and brings some brightness to an otherwise dingy area and dull dining scene. 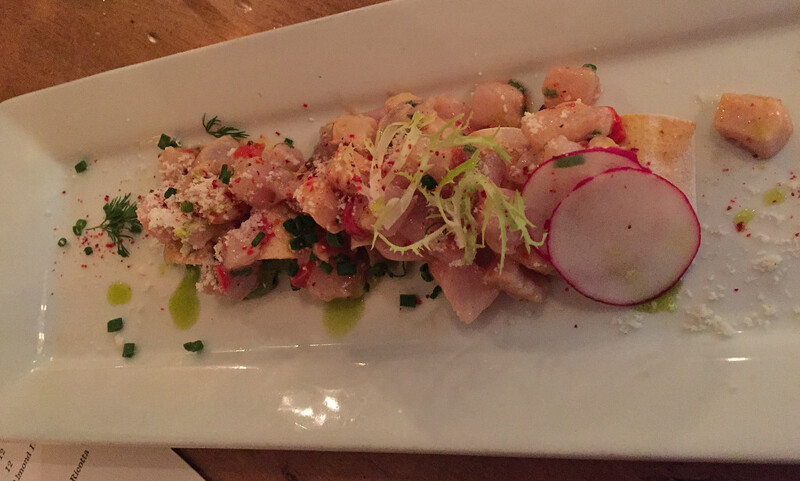 If you’re in Wilmington, la Fia is a must visit…and take Uber.